A long weekend in Colorado specifically to ride the Friends of the Cumbres & Toltec Scenic Railroad's Flanger (snow plough) special on Saturday 12th & Sunday 13th March. The Cumbres & Toltec is a 64 mile 3' gauge steam hauled heritage railway which winds its way through the mountains of southern Colorado and northern New Mexico. It has to be one of the most scenic heritage railways anywhere in the world. Motive power consists of a handful of ex-Denver & Rio Grande Western 2-8-2s, which despite being narrow gauge are far bigger than anything you would see on the mainline here in Britain. 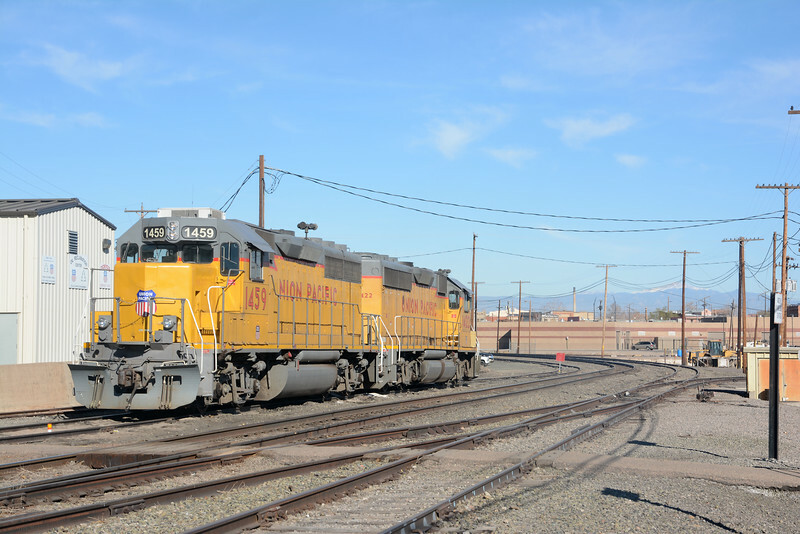 On our way from and to Denver we also shot standard gauge mainline (BNSF & UP) and shortline (San Luis Central and San Luis & Rio Grande) action. We also shot pictures of Denver's RTD light rail operation and their new (opening in April) heavy rail 25kV line to Denver International Airport. The Mile High City takes public transport seriously. That's PIkes Peak in the background, at 14000 ft it's the highest summit in the Rockies Front Range. The crew of 1459 and 1422 were due to go on duty at 10:00, they arrived just as we left the engine facility.